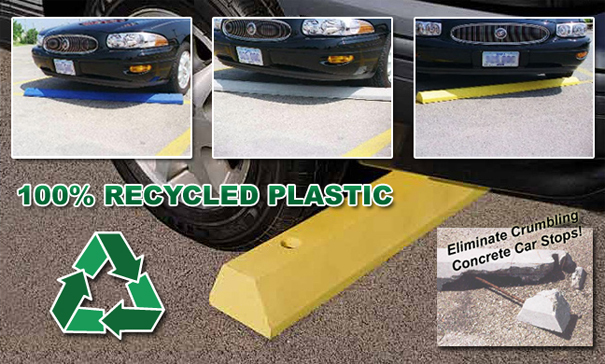 These durable recycled plastic car stops also commonly known as parking blocks help in maintaining order in residential and commercial parking lots without the maintenance commonly associated with concrete car stops. Solid coloring throughout means there is no need for painting or sealing to retain an attractive appearance year after year, even under the harshest of environmental conditions. Made from 100% recycled plastic, these car stops are resilient against any deterioration and corrosion caused from natural elements (expansion, contraction and UV exposure), road chemicals and normal wear & tear. This eliminates the potential dangers presented by exposed reinforcing steel rods frequently seen with traditional concrete car stops. Choose from the standard sized traditional model or the low profile competitor model. All models are lightweight and predrilled for easy single person installation. This feature greatly reduces labor requirements and also allows for easy removal — quite useful for repaving, seal coating and/or snow removal.